Diaz Beach Apartment - Mossel Bay Accommodation. 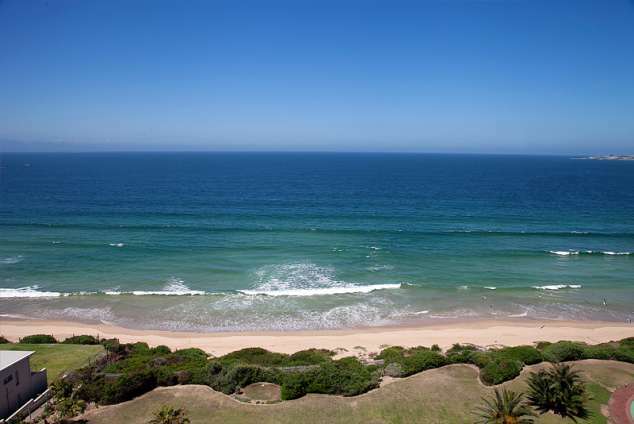 Diaz View is an absolute beachfront 3 bedroom self-catering apartment with amazing views over the ocean and Mossel Bay. The apartment is on the 8th floor of the Ocean II complex in Diaz Beach, next to the Diaz Beach Hotel. It is ideal for both holiday and corporate accommodation. It is within walking and short driving distance to many restaurants, bars and activities. The Ocean II complex has lawned BBQ areas and a pool. The apartment has 3 bedrooms, with 2 double beds and a twin. The main room has an ensuite and 2 of the rooms have fantastic sea views. There is another separate bathroom and fully equipped kitchen with washing machine and dryer. Diaz View has a dining table which seats 6 and a barbecue on the balcony. The apartment has satellite DSTV and a DVD player. There is 24 hour security, secure parking and direct access to the beach. Mossel Bay is only 5 minutes away, and there are numerous activities for all ages. Swimming, shark diving, whale and dolphin watching, fishing, hiking, cinemas, golf, horse riding and a casino. Botlierskop and the Garden Route Game Lodge are nearby and offer day safaris. Within a short walking distance the Diaz beach resort has a heated indoor pool, outside pool with slides and mini golf. George Aiport is approximately 30km away where various care rental options are available. 44704 page views since 18 Dec, 2008.